One has to wonder how the remaining four teams in the Women’s World Cup can top the quarterfinal games we saw last weekend. Three of the four quarterfinals needed more than 90 minutes to be decided. Two went to PKs. We saw the defending champs and host nation eliminated, the sport’s best player was eliminated, we had last minute goals to send games to overtime. Can we expect such drama in the semifinal round? Much has been said about the USA’s improbable comeback against Brazil. Personally, I can’t stop watching highlights and looking for new articles about the game. It’s been dubbed one the greatest American soccer games of all time, and it was only a quarterfinal match! The team must now channel their energy into preparations for the French, penalty kick winners themselves. France was the better team in their quarterfinal match against England, yet struggled to find the back of the net. Fighters til the end, they sent the game to extra time with a strike from Bussaglia in the 88th minute. France’s biggest weakness is their back line, members of which have not always communicated effectively throughout the tournament. One plus for the French is that they’ll have their starting goalkeeper, Sapowicz, back from her one-game red card suspension. The French front six are playing well and created many chances against England, though they had difficulty converting. They do a great job of utilizing space on the sidelines, and have some creativity in players like Necib, Thiney and Abily. The French scored both goals against Germany on corners, indicating their strength in the air. The USA will have a new face in the back line due to Rachel Buehler’s red card against Brazil. Becky Sauerbrunn will take Buehler’s spot at center back. This will be her first appearance in the 2011 World Cup. The USA has played inconsistently throughout the World Cup, but the Buehler red card may have been the best thing to happen to them. Playing down a man, they finally played with urgency and began to push for a goal, rather than waiting for the moment to present itself. The US needs to play the way they finished the Brazil game right from the start. They are the better team in this game and need to play like it. If Boxx and Lloyd control the middle of the field, this game will go to the US. Abby Wambach is playing with confidence and is willing to put this team on her shoulders to keep them moving towards her first World Cup title. The US also has the world’s best keeper in Hope Solo, who at times single-handedly keep them within striking distance of Brazil. Expect a defensive breakdown due to miscommunication with Sauerbrunn to lead to a French goal, but the US will be the better team, and will come out on top. Both of these teams have gotten progressively better as the tournament has gone on. Japan looked flat in the first half against Germany, but controlled the middle of the field in the 2nd half and extra time. Although they didn’t create many dangerous chances, they looked calmer on the ball, and frustrated the Germans with their stingy defense. Japan was patient, and came out the winners on a crafty shot by Maruyama in the 108th minute. Japan is playing very well right now. Their strategy is to possess the ball, and they have the potential for some delightful creativity. They are the shortest team left, but can make up for that with speed up front and on the wings. They’ll ride on the backs of veteran Sawa, who played the ball to Maruyama that was finished for the goal against Germany. Sweden is the only team that won their semifinal in 90 minutes, but in Japan they’ll be facing a much more formidable defense than the Australian back line. Sweden has dominated the midfield in every game of the tournament (remember that US loss? ), and now they have started the back of the net, which they struggled to do in their first two group matches. Seger and Dahlkvist will look to find Oqvist up top and Schelin and Sjorgran on the wings to create their offensive chances. Sweden is the larger team and they are very strong in the air. Whichever team is able to control the midfield battle will be the winner of this game. This one will need extra time to find a winner. Sawa is awesome. Whoever #4 is on Japan is awesome. I think a USA/Japan final would be a snoozefest though. So while I’m rooting for Japan, I won’t be disappointed with a Sweden win. Why not move Lepelibet(widely regarded as one of the best center backs in the women’s game) into her natural position instead of leaving her stranded on the left side again? Nothing against Sauerbrunn, but this makes no sense. 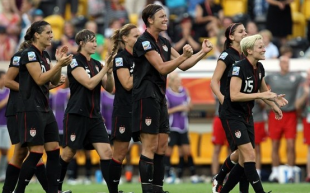 Why are Heather Mitts and Stephanie Cox even with the team if they aren’t going to play? Hell. If you’re moving her into her real position (duh) then move Rapinoe to left back. That way she’s on the field from the opening whistle at a position she has played before(duh, take two).